A Wiccan magic circle is regarded as a sacred cleansing place, where rituals, ceremonies and spells are performed. The circle gives boundaries for a reserve of concentrated energy and takes the role of a gate to the world of Gods. The circle itself symbolizes wholeness, perfection and unity, the creation of the universe, the cycle of seasons and the rebirth after death. The magic circle allows us to bypass the physical boundaries, and open our minds for higher and deeper levels of consciousness. Circles have been known to have magical properties in ancient times, when people drew them around the beds of the sick and ill to protect them from demons. The remnants of the stone circles in Britain are witnesses of the importance of circles within the pagan communities. Witches and sorcerers have went into the magic circle, experiencing the unity with Gods and the harmonious powers of nature. They couldn’t command the Gods, but they still invited them to the circle where the Gods could witness and take part in the rituals. 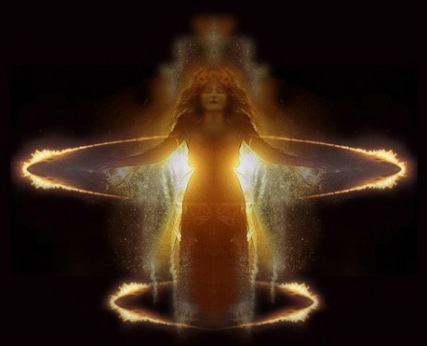 Negative energies were driven out as soon as the magic circle was drawn, other times the negative energies were swept away using a symbolic broom by a high priestess. The circle served as protector against unfriendly spirits and negative energy. The magic circle of witches was usually three meter in diameter, although sometimes it was drawn in bigger dimensions if there was a need for a large group of people. There were several altar and ritual instruments associated and used with magic circles such as a magic wand, a five pointed star, incense burner, a pot, a sickle, sword, cup, ropes and other items. A circle is usually drawn with a spear, although sometimes the use of a sword or a wand is also accepted. When the circle is drawn on the floor or on the ground (or even constructed from a magical rope), the witch can see that the energy plain is present. Candles are placed on each quarter point of a circle, points that are considered as “cardinal”. The participants are welcomed to enter the gates which close after all participants have entered. The magic circle includes four elements in itself, which are also divided by the four points in which candles are positioned. The participants then summon the guards of the four elements. If the ritual is being practiced outside, inviting the spirits of nature to take part is possible. When the ritual commences, the Goddess and God are summoned. A goal or a purpose is being set to the ritual and so it begins. It is possible to open the circle for entry or exit, but it always needs to be closed afterwards. When the ritual ends, the food and drinks are sanctified and are offered as a feast to the Gods, after which the participants of the ritual eat the food. The energy then disappears, the spirits and Gods part and leave the circle, the candles fade and the circle is destroyed (the way depends on the ritual). Witches sometimes draw such magic circles for protection in order to prevent physical harm or to protect themselves against invading forces. It is important to know that magic circles cannot work for an unlimited amount of time, thus there is a need to periodically redraw the circle when in need, in a way that corresponds the specific ritual. The term “circle” is used by witches and sorcerers as a synonym to their regular meetings. Some gatherings draw learning circles for those who want to become witches and are preparing to dedicating themselves to Wicca. Merry Meet, Happy Blessed Lammas!